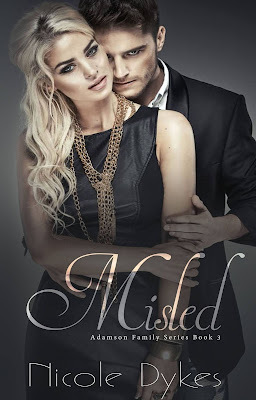 Misled (The Adamson Family #3) by Nicole Dykes. My life is golden. I truly have it all. Women, a fast paced racing career, fame, a massive house, and plenty of money. Of course, since I’m an Adamson the smooth ride is over as my past comes crashing through making everything complicated. Easy is my comfort zone. Difficult is my nightmare. My life has been anything but simple. I’ve seen things that will haunt me for the rest of my life. Still, I refuse to let fear control me. I will face every challenge head on and find a way to prove everyone wrong. It may be difficult, but I will make the world better. Taking the easy way out is not an option.